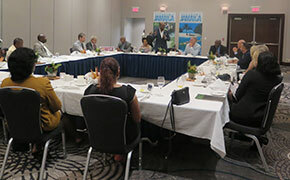 It has been an unsettling and worrying couple of weeks in the Caribbean, but Jamaica’s Minister of Tourism is carefully thinking about the long-term future of the region and his own country, as evidenced in a recent visit with Canadian travel trade and Caribbean ethnic media in Toronto. During the course of his speech, the Hon. Edmund Bartlett was careful to ask for a moment of silence out of respect for the islands and people who had been affected by the devastation of hurricanes Irma and Maria and the Mexican earthquake. Yet he did express optimism – particularly regarding the Canadian market to Jamaica. “Jamaica has the best product in the Caribbean. No other has the mix of experiences that we offer: the music, food and love. It’s a happy destination and we pride ourselves on being safe and secure. And we are working on 'seamless'," he told the group. The island is working on an expansion plan which will see rooms grow from 28K to 45K over five years, and improve the tourism offerings thanks to a combination of partnerships, investment, marketing, and renewal of human capital. He also foresees growing markets in China, India, Latin America and Eastern Europe, perhaps in multi-island experiences. 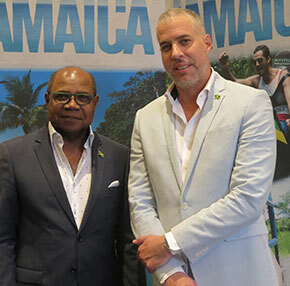 Jamaica has established a centre for tourism, slated to open next month, and in November, Kingston will be the site of a global conference hosting 157 ministers of tourism and over 500 companies from around the world. “The Caribbean is the most tourism-dependent region in the world,” Bartlett pointed out, “And tourism is 10% of the world’s GDP, employing almost 10% of the world’s working population.” It’s clear Jamaica is determined to keep tourism clearly in focus.